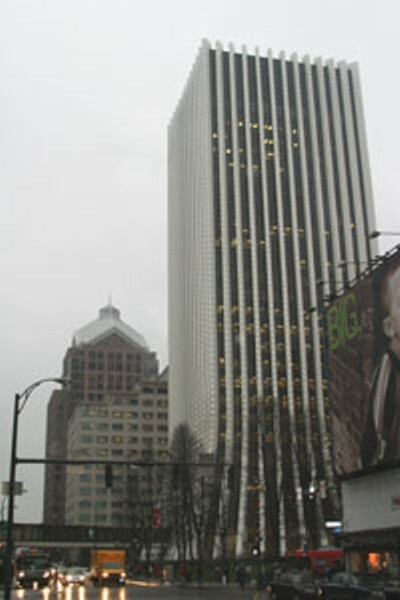 Photo by Krestia DeGeorge The two towers: Law firm Underberg & Kessler will move from Chase Square (foreground) to Bausch and Lomb Place (left) in downtown Rochester --- and get equipment rebates from the Monroe County Industrial Development Agency. To some people, it's just another way government can help the business community improve things for all of us. For others, it's a form of corporate welfare, public money headed to those who need it least. The County of Monroe Industrial Development Agency, an arm of county government, provides assistance to businesses that are expanding, building, renovating, or moving within the county. The help ranges from rebates on equipment purchases to low-interest loans and tax abatements. But not everyone is happy with the way those benefits are dispensed. Bill McCoy has been watching COMIDA on behalf of the local activist group Metro Justice for the past several years. Just within the last few months he's seen the agency approve assistance to Bazil's restaurant for an entry area for seaplanes, a low-rate loan on a truck for a Brockport contractor in exchange for creating a single job, and rebates for a law firm moving from one downtown office tower to another. But McCoy says it's not individual projects that bother him most. It's the sense that COMIDA has strayed from the purpose for which it was created: encouraging industrial development. "Subsidies should not go to retail and wholesale businesses," says McCoy, "because that doesn't bring money into the community from outside." Furthermore, by assisting such businesses, COMIDA favors one retailer or service provider over their competitors, he says. McCoy hopes to meet with COMIDA's new executive director, Terry Slaybaugh, to discuss his concerns. Slaybaugh came to the agency a few weeks ago after heading the county's airport authority under successive Republican administrations. "When we talk to Terry Slaybaugh, one of the things I want to suggest strongly is an economic-impact analysis," says McCoy. That would include studying whether one local company's COMIDA benefits might be offset by the job losses at another. If that's happening, "there's no net gain to the community," says McCoy. "It doesn't do any good to shift jobs from one store to another or one business to another." Metro Justice is concerned about more than simply the types of businesses COMIDA helps, says McCoy. The county is giving tax breaks to support private-sector enterprises at a time when budget crunches have put even essential services on the line, he says. "Where we get hurt is the tax exemptions," says McCoy. "If the county gives county tax exemptions, somebody has to make that up, and that's us." COMIDA officials defend the use of tax abatements, saying that they boost the local economy and generate more tax dollars than they cost. "They're grasping at straws," says McCoy. "They're grasping at anything they can do to make it look like they're doing something." COMIDA is grappling with forces beyond its control, says McCoy, including the changing nature of the global economy. For example, no local IDA will ever be able to stem the large-scale loss of US manufacturing jobs to developing nations, he says. Unless the agency reexamines its goals and methods, it risks irrelevancy, McCoy says. It will be relegated to the realm of handing out little favors to one local business at the expense of another. "Why should one law firm get subsidies for expanding their offices and buying new computers, telephones, copiers, whatever it is," says McCoy, "and another law firm not get that break? It doesn't make sense." • HenriettaBuilding Supplies. Benefit: rebates on purchases of new trucks and office and yard equipment. Anticipated growth: 4 fulltime jobs. • Donald Hibsch Contractor LLC. Benefit: low-rate loan on a new truck. Anticipated growth: 1 job. • Underberg & Kessler law firm. Benefit: rebates on computer and other equipment purchases associated with its move from Chase Square to Bausch and Lomb Place. Anticipated growth: 4 jobs. • Emerson Oil Company, Inc. Benefit: low-rate loan to buy a new truck. Anticipated growth: 2 jobs. • Kovalsky-Carr Electric Supply Company, Inc. Benefit: rebate on the purchase of a truck and a digital phone system. Anticipated growth: 2 fulltime jobs. • Bettina Properties, LLC. Benefit: property-tax abatement to construct a new building for the Brockport-based Weinstein Dental Group LLC, which plans to add 2 full-time employees. • Metalico Lyell Acquisitions, Inc. Benefit: sales-tax exemption to buy new recycling equipment and extend a concrete barrier. Anticipated growth: 6 fulltime jobs. • St. Paul Properties, LLC. Benefits: sales and mortgage-tax exemptions for renovating the vacant HarryFormanBuilding, 114-118 St. Paul Street, for mixed residential and retail use. Anticipated growth: 7 or more jobs. • 3111 South Winton Road, LLC: Benefit: sales and mortgage-tax exemptions for renovations for Genesee Region Home Care's move to the site. Anticipated growth: 50 jobs.